Cornerstone Collective: Can you introduce yourself and can we just hear a little bit about how your came to Christ and how you came to Cornerstone? 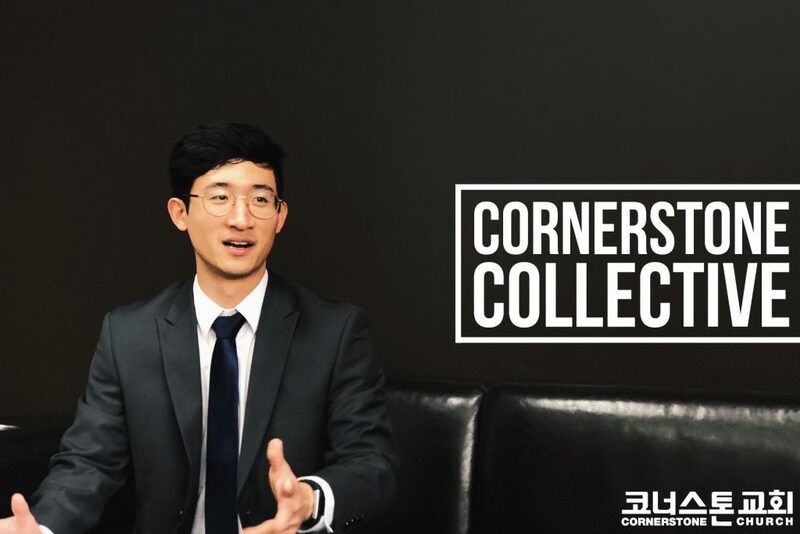 Pastor Joshua: Hi, my name is Joshua Suh- I’m a member of Cornerstone Church and now a 전도산님. I guess if I had to talk about my life story, it would have to start at a fairly significant event. When I was three years old, a significant life event took place where I drowned in a pool. I went in with my brother and we were playing around the pool but I fell in with my toy. My heart stopped. I was in there for several minutes but fortunately there was an electrician nearby who was supposed to be off duty, but he happened to be working that day and he got to me in the pool, he pulled me out, gave me CPR, and resuscitated me. But for me, that’s not coincidence, I believe that was kind of like a marker in my life and God’s way of telling me that He saved me because he had a purpose for my life. More than just working a 9 to 5 job, more than me living my life for myself, I believe He was claiming my life and saying, “You know, I saved your life and your life is now mine.” What He did for me physically, He did for me spiritually as well. That’s a significant event I want to mention and as I went throughout life and did the whole church routine and went to church with parents, Fridays, Sundays- didn’t think much of it until maybe 6th grade. During a winter retreat, that’s when I was saved. I really encountered the presence of God and that drastically changed my life. Through that, I remember coming home and telling my mom, “Mom, I met God and my life is forever changed. I promise I’ll do dishes everyday and I’m gonna vacuum everyday and I’m just gonna be the best son ever!” That lasted for maybe two/three weeks which is a pretty long time. Eventually, I fell into a sharp decline. But I think that kind of set up the scene for the rest of my spiritual life before I came to Cornerstone Church – a lot of ups and downs. At retreats, at these rallies or revivals I would experience these spiritual highs but after I’d experience really low lows. So basically there was no spiritual stability. Praise was very passionate but there was a huge lack of God’s word in my life. That’s where Cornerstone Church comes in. I attended my old church for 12-13 years and I never had a life of really consistent quiet times or reading scripture or diving into scripture – very passionate worship but just a huge lack of scripture. When I came to Cornerstone Church my spiritual life started to stabilize and I was no longer experiencing these high highs and low lows. As I meditated on scripture and as scripture became my foundation, I found myself being less shaken by other people’s words, being less shaken by my circumstances, and less shaken by the negative things I was experiencing in life where before the smallest thing would shake me. But having a daily life of QT and realizing the importance of having scripture as the inherent authority figure in my life- that really helped me stabilize my life and what not. So I came to Cornerstone Church – my walk with God was stabilized but when it comes to my career… I wanted to do something where I could use as a tool for God. But before this, I failed to mention that I actually knew I was called into ministry and to become a missionary early on – maybe Jr. High 7th/8th grade I had a burning passion to serve. I’ve always been serving in church but it was around Jr. High I had a heart for missions as well and I told my mom, “Mom, I’m going to be a missionary when I grow up.” I also told my high school counselor I was going to be a missionary and she went into the office and said, “I HAVE MY FIRST MISSIONARY! !” And I was just like, “Ohhhh, thank you” So I always knew I wanted to go into ministry and in that direction but somewhere along the way, there was this idea that was planted in my head that I needed to be something in order for God to use me. I need to have this certain skill set and I needed to make a certain amount of income for God to use me. I also wanted a certain amount of income because I wanted to have a happy family and I wanted to be the best husband, the best father and I always believed that that required me to have a good career, a good amount of income. So I put my ministry related goals and mission related goals on hold and I kept telling myself, “Oh, I’ll do it later, I’ll go into mission later, but first I’m going to pursue this career and I’m going to make a lot of money.” I thought I was doing it for God but I was fooling myself in the end, it was for myself. It was for my own selfish desires. When scripture came into my life and became a mirror it was like “OO you aren’t doing it for the glory of God, you’re doing it for yourself.” That’s when I realized- oh my goodness, I don’t need to equip myself in a sense; I don’t need certain tools; I don’t need this or that. I heard a quote that said, “God doesn’t call the equipped, He equips the called.” Because I’m called, God is going to equip me. When I realized that, just seeing my life through God’s lens, I really had to surrender my want for financial stability, I had to surrender my wants to be this perfect father and husband. Just because I go into ministry doesn’t mean I can’t be those things but I was idolizing it, idolizing money, idolizing being this and that but I was now finding my identity, finding my being in being a child of God. So I let go of what I idealized, what I visualized for my own life and I decided, “You know what God? – there’s a hymn that goes, “I have decided to follow Jesus” and I really think that became my life song where I can say that, “God, there’s only You.” My prayer was, “God, You’re enough and there’s nothing more I need in this world.” Looking at the life that Paul lived, he was so broken all the time. Poor – he didn’t have to be in that state. He chose to live a life that served God to the fullest and he was so full of joy because Christ was the center, not because of his circumstances or his possessions. So for me, it’s like man! I know that’s the life God wants me to live – with abandon for the things of this world and just abandoning my desires, my will and saying “God, not my will but Yours be done.” So that’s why I entered into ministry and I really believe that I’m doing what God has called me to do. And you know, honestly, I’m happier. Now that I’m doing what God has called me to do, I feel like a fish in water. Whereas before, pursuing these other jobs, studying for the GRE, or trying to be an OT – I really felt out of place but I put those feelings aside. I kept saying, “Oh I want this, I want this.” But now that I’m doing what I believe I was called to do, it’s like, “Oh! This is it! I know God, this is what you had for me.” So when I wake up, it’s no longer like, “UGH! I’m waking up at like 5:30 in the morning for 새벽 기도. It’s like man, I get to wake up and serve God. I am full of joy, my body is tired at times but my spirit is just so full. Cornerstone Collective: Thank You. I guess the last question would be, what does Cornerstone meant to you? Pastor Joshua: Cornerstone means foundation. Cornerstone I feel like to me is rock. Another way of saying foundation. I really can’t put it into other words because spiritually, Cornerstone has been so crucial in my spiritual development, in my spiritual formation. Like I shared before, without Cornerstone Church, I still would have been in that up and down state. Without scripture, without realizing the importance of scripture in my life, and without daily meditation of scripture in my life, my spiritual life would have been a wreck. I guarantee that. I still would have been experiencing these high highs where I’m just like “AHHAHAHHH” and low lows where I’m like “No one talk to me, I’m going through a moment right now :(” I literally used to do that and I used to shut people out and go into hermit mode. Literally I’d shut down my facebook and tell people not to talk to me. But for me, after scripture and Christ became my center, I feel so much more stable, no matter what life’s been throwing at me. Yeah, things get hard but I find myself overcoming it. In that way, Cornerstone has just been a foundation on which I can stand. Christ, scripture has been my Cornerstone and that’s why I’m not being shaken. At the same time, Cornerstone Church itself – these days the word that I relate cornerstone to has been family. When Paul writes to the Corinthian Church, when he writes to these different churches, and when he said “brother,” he genuinely meant that. I’m connected with the members of Cornerstone Church through something that’s deeper than biological blood and that’s the blood of Jesus. And just realizing that and serving at this church with 목사님 and 사모님 seeing how they genuinely treat me as a precious child of God and how much they pour out into my life, having fellowship with the Jr. High students, the High School students, with College/Young Adult all way to the Sunday school, young students, I feel like I’m a part of a family. A genuine body of Christ. I think that’s something that’s really special that not many people have. I have a family in Christ and Cornerstone has become my family. I’m really thankful for 목사님 and 사모님 because of the way they show me love and I really feel like that’s how God loves me in the sense that it’s very unconditional. They pour out so much and give me so much that I don’t know where to start in repaying them. There’s nothing I can do to repay them. I can’t give them money. I can’t buy them nice clothes, I can’t buy them diamonds. I don’t have the money to do that. But I can only express my gratitude – “thank you guys so much.” But I feel like their display of love towards me is a Godly love because that’s the same relationship I have with God. No matter how much I do for God, there’s nothing I can ever do to repay the debt that Christ payed for me. All I can do it express my gratitude and try. I don’t know what else to give you (God) but my life. And so, that’s why I’m thankful for목사님 and 사모님 and countless others: Pastor Sung, Pastor David, all the leaders that have just invested in to my life in that way. The Jr. High teachers, the Sunday School teachers, all invested into my life in ways where I don’t know how to repay them, I can’t do anything but to just thank God and thank them and to live a life of gratitude. That’s why I can never complain. There are just so many blessings. I don’t have a Bugatti, I don’t have a Lamborghini, I live in the closet right now (a literal closet where I can’t even stretch my arms out all the way) but I can’t help waking up and saying, “Thank you God. I have so much. I really have so much and there’s nothing I can complain about.” It’s all because of Him. 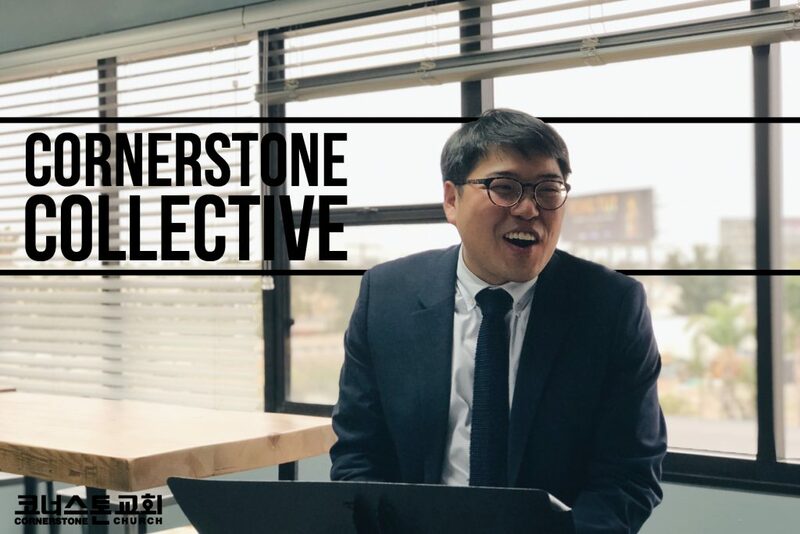 Cornerstone Collective: 자기 소개와 함께 어떻게 예수님을 영접했고 어떻게 코너스톤 교회에 오게 되었는지 들어봐도 될까요? Joshua 전도사님: 안녕하세요. 제 이름은 Joshua Suh 입니다. 코너스톤 교회의 일원이고 이젠 전도사님 입니다. 제가 저의 삶의 대해 얘기를 해야 한다면, 꽤 중요한 사건에서 부터 시작해야 합니다. 제가 3살때, 수영장에서 익사할뻔한 경험이 있었습니다. 저희 형과 함께 수영장 바깥에서 놀다가 장난감과 함께 빠졌습니다. 제 심장이 멈췄었죠. 몇 분 동안 물안에 있었지만 다행히도 근처에 전기 기사가 쉬는 날이여야 했는데 어떤 이유로 근처에서 일하다가 절 수영장에서 꺼내고, 응급호흡을 해주고, 다시 살려냈습니다. 하지만 저에겐 이건 우연이 아니었습니다. 전 이것이 제 인생의 하나의 중점이라고 믿고 하나님이 저에게 목적이 있으시기에 살렸다라고 말한거라고 믿습니다. 아침 아홉시부터 다섯시 까지 일하는 직장보다, 제가 제 삶을 저 자신만을 위해 사는 것 보다, 하나님이 제 삶을 주장하시고 “너는 내가 구했기에 이제 너의 삶은 내 것이다” 라고 말씀 하시는 것이었습니다. 저에게 육적으로 행하신 것을 하나님은 저에게 영적으로도 행하셨습니다. 저는 태어났을때부터 부모님과 함께 규칙적으로 금요일과 주일마다 교회를 갔지만, 한 초등학교 6학년 까지는 별 생각없이 갔습니다. 하지만 그때 겨울 수련회에서 저는 구원을 받았습니다. 저는 진실로 하나님을 체험 했고 제 삶은 너무나도 크게 달라졌습니다. 그 경험을 통해 집에 돌아와 어머니께 이렇게 말했던 기억이 있습니다. “엄마, 내가 하나님을 만났고 내 삶은 이제 영원토록 변했어. 매일 매일 설거지 하기로 약속하고 청소기 돌리기로 약속하고 세상에서 가장 좋은 아들이 될께!” 이게 한 2/3주 정도 갔던 걸로 기억하는데, 꽤 긴 시간 이였습니다. 하지만 결국 급한 내리막길로 떨어졌죠. 하지만 이 것이 코너스톤 교회를 만나기 전 저의 영적 삶을 설명하는것 같습니다. 많이 올라갔다 내려갔죠. 수련회나, 집회나, 부흥회에서는 영적으로 높은 것을 채험했다가 그 후에는 정말 낮은 것들은 경험했습니다. 딱 말하자면 영적 기반이 없었죠. 찬양은 정말 열정적이였지만 제 삶엔 하나님의 말씀이 너무나도 부족했습니다. 여기서 코너스톤 교회가 등장합니다. 제 전 교회를 한 12~13년 정도 다녔는데 전 한번도 한결같은 QT생활이나 말씀 읽는 생활이나 말씀에 빠진 적이 없었습니다. 예배에선 정말 열정적이였지만 말씀이 삶에 그저 존재하지 않았죠. 코너스톤 교회에 오고서 부터 저의 영적인 삶이 안정되기 시작했고 너무 영적으로 흥분하거나 절망하는 경험이 없어졌습니다. 말씀을 묵상하고 말씀이 저의 반석이 되면서, 다른 사람들의 말로 덜 흔들리는 제 자신을 발견했고, 저의 상황에서 덜 흔들렸고, 삶이 주는 부정적인 경험으로부터 덜 흔들리는 걸 경험하기 시작했습니다. 전에는 아주 작은 일로도 시험받았는데 말이죠. 하지만 매일 QT의 삶을 살고 하나님의 말씀을 저의 내자하시는 권위자로 삼으니 제 삶이 안정적으로 되는데 큰 도움이 되었습니다. 코너스톤 교회에 오고서 하나님과의 삶은 안정적이 되었지만 제 직장은… 하나님의 도구로 사용받는 일을 하고싶었습니다. 그 전에, 제가 말하는걸 잊어버렸는데 전 제가 사역자로 부르심을 받고 선교사가 될 것이라는걸 일찍부터 알았습니다. 한 중학교 7/8학년도즈음에 불타는 열정으로 섬기고 싶은 마음이 있었습니다. 전 항상 교회를 섬겼었지만 중학교때 선교를 향한 마음이 있어서 어머니께 “엄마, 난 커서 선교사가 될꺼야.” 라고 말했었고, 고등학교 상담선생님께 선교사가 된다고 말한 후 그 선생님께서 “내 첫 선교사가 나타났어!” 라고 사무실에서 말하고 전 “아. 감사합니다” 라고 말한 적도 있습니다. 이렇게 전 항상 사역을 하고 싶었고 그 쪽 방향으로 가고 싶었는걸 알았는데 가던 길에 제게 어떤 것이 있어야지만 주님이 절 쓰실 수 있다는 생각이 머리에 박혔습니다. 전 그 특정한 기술이 있어야만, 어느 정도 돈을 벌어야만 하나님이 절 쓸 수 있다고 생각했습니다. 그리고 전 행복한 가정을 원하고 최고의 남편, 최고의 아버지가 되고싶었고, 그러려면 어느정도 좋은 직장이 필요하고, 좋은 수입이 필요하다고 믿었기에, 어느 정도에 월급을 원했습니다. 그래서 전 저의 사역과 선교에 관한 목표들을 잠시 접어두고 스스로 “나중에 할게, 선교도 나중에 갈께. 먼저 이 직장을 쫓고 돈을 많이 벌 거야” 라고 되뇌었습니다. 전 제가 하나님을 위해서 일한다고 생각했는데 결국 제 자신을 속이고 제 자신을 위해 일하고 있던 것이었습니다. 제 이기적인 욕심을 채우기 위해서였죠. 주님 말씀이 제 삶에 들어오고 말씀이 제 거울이 되었을때 “넌 하나님의 영광을 위해서 일하는게 아니라 너 자신을 위해서 일하는 거야” 라는 걸 깨달았고, 장비를 갖추는게 아니라, 어떤 도구들이 필요한게 아니라, 이것 저것이 필요한게 아니라, “하나님은 준비된 자를 부르시는게 아니라, 부르신 자를 준비시킨다” 라는 말처럼, 하나님이 날 부르셨기에 하나님이 날 준비하실 것임을 알게 되었습니다. 그 후에 제 삶을 주님의 눈으로 보니 경제적인 안정을 원하는 제 마음을 주님께 내려놓아야 했고, 완벽한 아버지와 남편이 되겠다는 마음을 내려놓아야 했습니다. 제가 사역을 한다고 이것들을 못한다는건 아니지만, 전 이것들과 돈을 우상처럼 섬기고 있었는데, 이젠 하나님의 자녀로서 제 자신이 누구인지를 찾았습니다. 그래서 제 우상들을 내려놓고, 제가 그렸던 제 삶을 내려놓고, “주님 뜻대로 살기로 했네” 라는 찬송가가 내 인생에 노래가 되겠다고 결단했고, “하나님, 당신 밖에 없습니다.” 라고 이제 고백할 수 있습니다. 제 기도는 “하나님, 당신이면 충분하고 그 이상으로 필요한 건 없습니다.” 사도 바울의 삶을 보면, 그의 삶은 항상 고난으로 가득찼습니다. 그는 가난했지만, 그래야 할 필요도 없었습니다. 그는 하나님을 최선을 다해 섬기는 삶을 살기로 선택했고, 그는 그의 상황과 물질이 아닌 주님이 중심에 있었기에 기쁨으로 가득찬 삶을 살았습니다. 전 제가 이런 삶을 살고 싶다는 걸 압니다. 세상과 나의 욕심, 내 뜻을 내려놓고 “주님, 제 뜻 말고 주님의 뜻 이루소서” 라고 고백하는 삶을 살고 싶습니다. 그래서 전 사역자의 삶을 살기 시작했고 진심으로 주님이 절 사역자로 부르셨다고 믿습니다. 그리고 솔직히 전 지금이 더 행복합니다. 주님일을 하기 시작하니까 물 만난 물고기 같습니다. 다른 직장을 쫓고 GRE를 공부하거나 작업치료자가 되고싶을때에는 제가 제 자신이 아닌 것 같았지만 그런 마음을 밀어내고 계속 “아냐 난 이걸 원해, 이걸 원해” 라고 속으로 반복했다면, 이제 주님이 부르신 일을 한다고 믿으니 “주님! 이것입니다! 이게 하나님께서 절 위해 준비한 일입니다.” 라는 마음이 있습니다. 이제는 더이상 일어나도 “악! 새벽 다섯시 반 새벽기도를 위해 일어나야하네!” 가 아니라 “주님을 섬기기 위해 일어날 수 있네”가 되었습니다. 기쁨으로 가득찬, 몸은 피곤하지만 영은 충만한 삶을 살고 있습니다. Cornerstone Collective: 감사합니다. 마지막 질문은, 코너스톤은 당신에게 무슨 뜻입니까? Cornerstone Collective: Can you introduce yourself and talk about how you came to Christ? Pastor David: Well, my name is David Lee, korean name, 이철호. I came to Christ when I was pretty young in San Antonio, Texas, where I was born. At that time, our church’s Sunday School was just getting started. We had one of our first VBS’ (Summer Vacation Bible Schools) when I was around 5 or 6. There are two memories that are still clear in my mind. One was the VBS that Sam Benedict, who was the Sunday School teacher at the time, was leading and other was the alter call. If I remember correctly there weren’t that many students there. That was when I put my faith in Christ and decided to follow him. Now as a young child, I don’t think I understood all the theology behind what it means to put your faith in Christ but the bare tenants were there. I knew I was a sinner; I knew Jesus was the only way; and I put my faith in Him. The theology would develop later. So that’s how I came to Christ. I was a young boy in San Antonio, Texas and that’s kind of my story of my conversion so it’s been quite a while. CC: Leading in, can you talk about why you decided to dedicate your life to the Lord? Pastor David: If I get the timeline correct, I received Christ when I was around 5 and I moved to Los Angeles when I was 7. This experience that I’m going to talk about happened a year before I moved to Los Angeles. It was when I was 6. I don’t know the exact season but, I was in my room; I was playing with Legos. I just felt this extreme urge that I needed to serve and I remember that feeling was so strong – it was to the point where I had to let go of everything I was doing and really think about it. It was just a surreal moment. Looking back on it now, I believe that’s when God really called me into the ministry. Now what had happened was, as soon as I got this experience, it felt just like…..I don’t know, it’s hard to explain. It was a surreal experience and almost like an out of body experience. But that strong urge that “you need to serve” was immediately in my mind. I thought to myself that I needed to be a Pastor. If I’m going to serve people and if I’m going to help people—that’s the way, to be a Pastor and to bring people to Jesus. I had thought about my parents, my dad, who is a Pastor. He serves people and if I’m going to do the same, I need to also be a Pastor. So I remember my parents were in the living room, on the couch, and I ran there as a 6-year-old kid and told them boldly, “when I grow up, I’m going to be a Pastor.” Now, obviously, I didn’t understand fully what that meant. But growing up as a PK, a Pastor’s Kid, God allowed me to see the ups and downs of ministry – Pastoral ministry. Yes, there’s a lot of pain there, there’s a lot of difficulties and hardships there, but ultimately when I looked at my parents, I saw that it brought them so much joy. When people were coming to Christ, when people in the church were growing in their relationship with the Lord, they were overjoyed – that made their day. I found myself eventually in college beginning to serve as a Jr. High teacher. Now up to this point in my life, after proclaiming to be a pastor as a 6-year-old child, becoming a Pastor was always in the back of my mind but things would flip flop. I looked at the difficulties and thought to myself, “Do I really want to be a Pastor?” “Do I really understand what I’m getting myself into?” But for some reason, I just couldn’t shake that feeling, shake that urge. So always in the back of my mind, it was that: “You’re going to be a Pastor, you’re going to be a Pastor.” Then when I got into college and I started serving, I started experiencing the joys of Pastoral ministry. Just keeping at it, it became a greater blessing in my life and I realized, “Man, I do believe with all my heart that this is what God has called me to do.” So after college, I went to seminary, got my M. Div., and here we are now. I’m serving as a college/YA Pastor at our church and it’s been a whole lot of fun. CC: So you grew up in Cornerstone; you were there when it first started. Looking and thinking back on it now – what does Cornerstone mean to you? 질문: 간단한 자기 소개와 하나님을 어떻게 믿게 됐는지 말해 주실 수 있나요? 철호전도사님: 제 이름은 David Lee, 한국 이름은 이철호 입니다. 저는 예수님을 꽤 어렸을때 믿게 됐습니다. 태어난 곳은 샌 안토니오 텍사스 입니다. 저희 교회 주일학교가 막 시작하던때, 첫 VBS, 여름성경학교에 참석할때 제 나이는 다섯살 이었습니다. 그때 저에게 선명하게 남은 기억이 두가지 있습니다. 하나는 주일학교 선생님이였던 Sam Benedict이 VBS때 인도하신 구원초청입니다. 제 기억엔 그때 학생들이 많은건 아니었습니다. 하지만 전 그때 예수님을 믿었고 예수님을 따르기로 했습니다. 어린 아이로서 제가 구원에 관한 신학을 완전히 이해했던건 아니지만, 예수님을 믿는 기초적인 신앙은 있었습니다. 신학에 관한 지식은 시간이 흐르면서 배웠습니다. 이렇게 제가 예수님을 믿게 되었습니다. 저는 산 안토니오 텍사스에서 어린 나이에 예수님을 꽤 오래전에 믿게 되었습니다. 질문: 이어서 왜 주님께 삶을 바쳐 섬기겠다는 결심을 하셨는지 설명해주실 수 있나요? 철호전도사님: 제 기억이 맞다면, 저는 다섯살 쯤에 예수님을 믿었고 일곱살때 LA로 이사를 갔는데, 이사가기 일년전에 있었던 경험을 얘기 하겠습니다. 제가 여섯살때, 어느 계절이었는지는 기억을 잘 못하지만 전 제 방에서 레고를 가지고 놀고 있었습니다. 그때 저에게 이웃을 섬겨야 한다는 강렬한 무엇을 느꼈습니다. 그 느낌이 너무 강해서 전 모든걸 내려놓고 생각에 빠질 수 밖에 없었습니다. 무언가 비현실적이었던 순간이였고, 뒤돌아보니 그 순간에 하나님께서 저를 사역자로 부르셨습니다. 그때에 경험을 돌이켜 보면, … 모르겠습니다. 말로 표현을 못하겠습니다. 정말 신비로운 경험이었습니다. 하지만 “섬겨야 한다”는 그 강렬한 느낌은 저에게 목사가 돼야 한다는 생각이 들게 했습니다. “사람을 섬기고 사람을 도와줄 거라면 목사의 길을 가야지” 라고 생각했습니다. 저희 부모님, 특히 목사였던 제 아버지는 사람들을 섬겼고, 저도 사람들을 섬기려면 목사가 되야 했습니다. 그래서 여섯 살이었던 저는 거실 소파에 앉아 계시던 부모님께 달려가 “나는 커서 목사가 될거야!” 라고 자신있게 말했습니다. 당연히 저는 제가 하는 말을 온전히 이해하지 못했습니다. 하지만 목사님의 아들로 자라면서 하나님은 저에게 목사의 직분의 좋고 나쁜점을 볼 수 있게 해주셨습니다. 많은 고통과, 아픔과, 어려움이 있지만 저는 부모님을 통해 목사의 직분을 통해 오는 기쁨을 볼 수 있었습니다. 사람들이 예수를 영접할때, 교회 성도들이 하나님과의 관계가 더 가까워지고 성장할때, 부모님은 너무나도 기뻐했고 행복해 하였습니다. 시간이 흘러 대학생이 된 저는 어느새 중등부 선생님으로 섬기기 시작했고, 여섯살 목사가 되겠다고 고백한 뒤부터 지금까지 항상 “목사가 되야지” 라는 생각은 제 마음속 깊은곳에 있었지만 헷갈리지 않았던 것은 아닙니다. 목사의 삶의 어려움을 보며 전 제 자신에게 이런 질문을 했습니다. “난 정말 목사가 되고 싶은가?” “난 정말로 내가 무슨 선택을 하는지 이해하고 있는가?” 하지만 전 섬겨야 한다는 그 느낌, 그 마음을 잊을 수 없었습니다. 그래서 전 항상 “난 목사가 될꺼야” 라는 생각을 가지고 있었고, 섬김을 시작한 대학생때부터 목사의 직분에서 오는 기쁨을 경험하기 시작했습니다. 계속 열심히 섬기다 보니 섬김 그 자체는 어느새 제 삶의 큰 축복이 되어있었고, “온 마음으로 하나님이 나를 목사로 부르심”을 믿고 깨달았습니다. 그래서 대학을 졸업하고 전 신학교에 들어가 목회학 석사 학위를 받았고, 지금 대학/쳥년 부 전도사님으로 즐겁게 섬기고 있습니다. 질문: 전도사님은 코너스톤 교회의 시작부터 지금까지 함께 자라셨습니다. 지금 전도사님 에게 코너스톤은 무슨 의미를 가지고 있습니까? 철호전도사님: 좋은 질문이네요. 제일 처음부터 있었기 때문에 좀 돌려 말하겠습니다. 코너스톤 교회는 1993년, 제가 일곱살때 저희 가족이 LA로 이사오면서 시작했습니다. 제가 교회를 위해 했던 첫번째 섬김은 신발 정돈 이었습니다. 코너스톤 교회는 저의 할머니가 우리 가족을 위해 준비해주신 집 거실에서 시작했습니다. 저에겐 매주 주일 마다 저희 집으로 오는 많은 사람들을 보며 흥분했던 기억이 있습니다. 그 후 제가 제일 처음으로 했던 일은 사람들이 신발을 벗으면 그 신발을 문 바로 옆에 있던 계단에 선을 맞춰 정돈하는 일이었습니다. 이게 저와 제 동생의 일이였죠. 다른 분들도 저와 같은 대답을 했을지 모르지만, 이십사오년 후 제가 이 이야기를 꺼낸 이유는 코너스톤을 가족이라고 생각하기 때문입니다. 한 몸이죠. 우리는 완벽하지 않습니다. 하지만 우리는 함께 예수님의 보혈의 피 아래 하나되어 서로를 도우며 서로의 삶을 활기롭게 합니다. 아픔을 치료하시는 하나님을 체험하고, 사람들에게 희망과 기쁨을 전합니다. 힘든 상황일지라도, 이게 가족이라고 생각합니다. 이 형제 자매들과 함께 예수 아래 같이 삶을 체험하는 것은 제게 큰 기쁨과 특권이였습니다. 대학 청년부 전도사로서 중등부 부터 가르쳤던 학생들과 어렸을때부터 봐왔던 학생들이 대학생이 되가며 하나님안에서 성장하는 모습을 볼때 전 너무나도 기쁩니다. 보이지 않는 곳에서 교회를 섬기는 사람들을 볼때, 기도의 삶을 사는 부모님들을 볼때, 온 성도들이 주일 마다 같이 점심을 먹을때 전 참 도전을 받습니다. 코너스톤의 이런 부분들을 전 기대합니다. 예배는 당연하고, 예배 후 점심 시간에 막 여기 저기 뛰어다니는 아이들의 모습, 대학 청년부가 서로 친교를 나누는 모습, 테이블 마다 어른들이 소통하는 모습들 전부 참 중요하다고 생각합니다. 교회 안에 많은 사람들이 자신들의 시간과 삶을 바쳐 서로를 섬기고 서로를 온전히 하나님 안에서 자라게 합니다. 전 코너스톤을 생각할때마다 이것을 생각합니다. 우린 그리스도의 몸이고 이것이 저의 기도 제목입니다. 우리가 예수님 안에 서로 하나됨을 지키기 위해 성령님과 말씀 안에서 최선을 다하는 것. 전 코너스톤을 생각할때 이것을 생각합니다. 코너스톤 교회 이종용 목사입니다. 우리 Nicole, Candy, Katherine, 그리고 Ashley 가 제 방에 들어 왔는데 간증을 하라고 그러네요. 나는 애기때부터 교회를 다녔어요 그런데 어려서는 예수님을 믿을수가 없었어요. 예수님이 처녀 동정녀 처녀의 몸으로 임신해서 이땅에 태어 나셨다 는 사실을 믿을수 없었죠. 그리고 고난을 받으시고 십자가에서 죽으시고 삼일만에 죽음을 이기시고 다시 부활 살아나신 것을 믿을수가 없었어요. 인간의 머리로는 도저히 믿을수 없는거죠. 그래서 예수를 믿는 척 하면서 초등학교, 중학교, 고등학교, 대학교, 청년, 교회서 아주 착실한 그리스도인 같이 지냈어요. 그러다가 제가 가수가 되고 제 노래가 우리나라, 전국에서 일등을 계속 하게 되었어요. Mbc tv 금주 인기가요 라는 유일하게 가수들 노래 중에 일등 부터 100등 까지 뽑는 프로그램이 있었는데, 제 노래가 이등을 4월달 부터 12월달까지 계속 하는 바람에 제가 가수가 됐고 인기 가수가 됐어요. 그러다가 그당시 대마초 사건으로 나는 대마초를 피워 보지는 못했지만 서대문구치소 세씨봉 이라고하는 우리 윤형주잔로님 이장희씨 내가 서대문구치소에 들어 가게 되었어요. 그래서 120일동안 있는 가운데 처음으로 나의 지난 과거를 생각 해보고 그리고 내가 어디에 있는가 하고 어디로 가는가 인생은 무엇인가? 죽음에 대해서 죽음 후에 아무것도 없는 건가? 이렇게 죽음으로 모든일이 끝나는가? 그렇지 않으면 동물과 다른 것이 뭐가 있을까? 선 과 악이란 무엇인가? 보람있게 사는것과 그 헛됀삶을 사는것은 무옸안가. 그 안에서 많은 걸 생각 하게 되었어요. 그러면서 인생에 가장 밑바닥에 떨어져 있을 때- 가장 높은 곳에서 최고의 인기를 얻으면서 운전사가 있고 bodyguard가 있고 그리고 나를 도와주는 사람들이있고. 그러면서 인가 가수 생활 하다가 하루 아침에 Jail 가장 인생 밑바닥에 떨어졌을 때 가장 캄캄할 때 빛 되신 예수님 태양보다 더 밝은 빛을 바울이 다메섹에 가는길에 봤다고 그랬어요. 눈이 멀게되고 말에서 떨어 졌다고 그랬는데 빛 되신 빛이신 나의 인생을 비춰주는 참 예수님을 믿게 됐어요. 그러니까 인간에 머리로 믿을수 없었는데 이게 주님에 은혜죠. 도 내가 낮아 지니까 이 천지 만물을 창조하신 창조주 하나님을 믿게 된 거죠. 믿음이라는 것은 가장 신비에 신비고 기적이고 표적이고 능력인것 같애요. 축복 인거 같애요. 아무나 믿는거 아니잖아요. 내가 누구를 믿는다고 그러는데 믿으려고 노력해서 돼나요? 어느날 그가 믿어지는 거죠. 믿음은 그런 거 더라구요. 믿음은 눈에 볼수가 없더라고요. 진실은 눈에 안 보이 더라고요. 눈에 보이는건 다 변화 되죠. 그러나, 사랑, 진실, 순수함, 정직함, 눈으로 안 보이잖아요. 가장 값진것은 눈으로 안 보이더라고요. 그 안에서 내가 낮아지니까 높으신 주님이 보이기 시작하고 믿게되고 그래서 예수님을 영접하게 됐어요. 그러고나서 제 인생이 달라졌어요. 나만을 위해서 사는 네가 이제는 예수님은 만나면요 이웃을 위해서 살고 시퍼요. 주고싶어요. 받기만 하다가 또 내가 최고라고 왜치다가 아, 나는 아무것도 아니구나, 주님의 은혜 구나 우리 예수 그리스도는 나의 주의시고 구원자 이시구나 하나님이시구나. 그래서 주님을 높이고 내가 낮아지는 거예요. 그러면서 막 주위를 사랑하고 싶어요. 주고 싶어요. 무엇보다도 가장 큰 사랑은 그가 죽음을 이기고 영생을 얻는거에요. 갖을수 있도록 도와주는 거죠. 그래서 제가 목사가 됐어요. 한국에서 Jesus Christ Superstar라는 Rock opera가 있었는데 거기서 제가 주인공, 예수역을했어요. 249에 예수역을했죠. 연습까지하면 한 1,000번 예수역을 한거 같아요. 그런가운데 마태, 마가, 누가, 요한, 사복음서를 많이 읽었어요. 믿음은 들으면서나며 들음은 예수그리스도의 말씀으로 말미암으니라라 하신 말씀대로 주님을 너무 사랑하게 됐어요. 주님일을 하고 싶어서 미국에와서 신학 공부를 하고 지금 까지 목회를 하고있어요. 얼마나 행복한지 몰라요. 정말 보람이 있어요. 코너스톤은 얼마나 많이 모이는가 얼마나 큰 건물을 교회를 갖는가 여기에 힘쓰길 보다는 한 영혼에 천하보다도 귀하게 여기는 교회- 이것을 제가 원해요. 한 영혼 한 영혼을 섬기는. 요한복음 마지막장에 보면 예수님께서 요한에게 베드로에게 내 양을 치라 내양을 먹이라 그랬어요. 그래서 먹여야 되고 돌봐야되죠. 그래서 에베소서 4:11-16 말씀이 우리 코너스톤이 시작 하면서 제가 가졌던 말씀이예요. 성도를 온전하게 하며 봉사의 일을 하게 하며 그리스도의 몸을 세우는 교회. 이 것을 위해서 하나님에 아들이신 예수를 아는 일과 믿는 일에 하나가 되어 온전케 되어 예수님의 장성한 분량에 충만하게 될 때까지 이르는 교회 하나님에 사람들. 이걸 위해서 저는 최선을 다 하는거예요. 그래서 오직 성령이 너희에게 임하시면 권능을 받고 예루살렘 온 유대와 사마리아와 땅끝까지 이르러 나의 증인이 되리라 주신 말씀 그대로 나의 삶에 현장에서 주님의 능력을 받아서 거기서 예수님 처럼 사가는 예수님에 증인의 삶을 사는 멋있는 하나님에 사람들. 그인원이 얼마가 돼던 상관 없어요. 바로 그런 교회 이것이코너스톤이 가지고 있는 비젼 이에요. 미국에 있는 이민 교회에서는 1세교회 하고 2세교회- 영어권 교회 한 어권 교회로 나뉘어져 있어요. 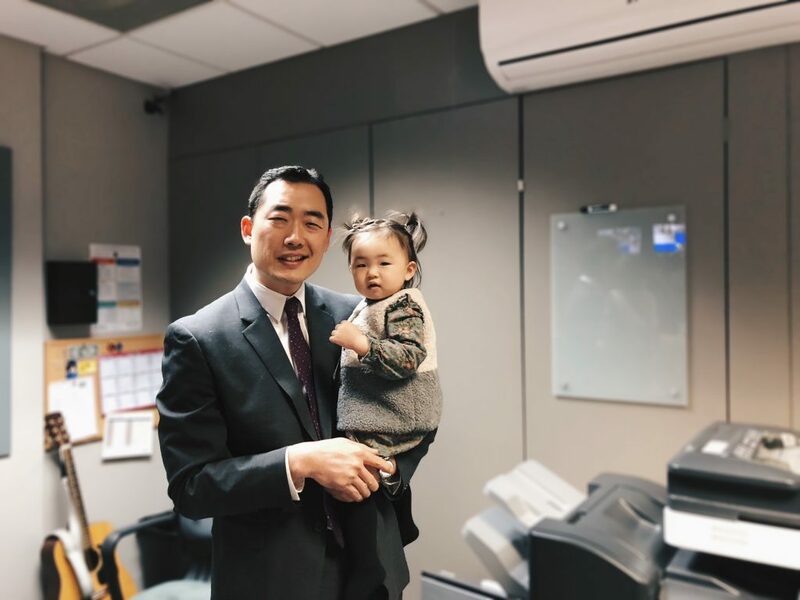 근데 성경은 안 그래요. 사마라인과 유대인이 예수로 하나로 돼요. 사도행전 10장에 보면 고넬료 백부장 이방인 로마장교와 베드로 유대인이 함께 식사를 해요. 이것은 말도 안 되는 거에요. 유대인들은 이방인과 식사를 못 해요. 그런데 함께 식사를 해요. 예수님 때문에. 하나가 된 거죠. 거기에 희생이 있죠. 그런데 이 세대 이민 교회는 언어 때문에 교회가 갈라져요. 1세 2세 때문에 갈라져요. 외그래요? 이기적이어서 그래요. 편한걸 찾는 거예요. 나는 우리 교회는 어린이부터 어른까지 1세와 2세 그 개념 없이-family, we are the family of God- 하나님에 가족 또 교회를 그리스도의 몸이라고 그러잖아요. Body of Christ. 예수님이 머리고 우리가 몸이다. 얼마나 귀해요? 그래서 1세 2세가 아닌 영어권 한어권이 아닌 어린이부터 어른까지 1세와 2세 영어권 한어권이 함께 천국의 가족을 이루어 가는 교회. 거기에 바로 대학생들이 있고 청년들이 있고 중등부가 있고, 고등부가 있는거예요. 하나예요. 한국에서 갓온 중학교 고등학교 학생들이 뭐해요? 교회서 한어부에가서 믿음 생활하면 영어부하고 한어부하고 완전 분리 있어요. 교재가 없잖아요. 그런데 학교가면 만나잖아요. 왜 교회가 분리가 돼요? 조금만 있으면 영어로 공부해야 되는데. 그러면 교회서 우리가 도와 줘야 되잖아요. 빨리 영어를 배우고 빨리 미국에 적응해서 함께 공부할 수 있도록 도와 주는게 교회가 돼야 되잖아요. 근데 왜 갈라져 있어야 돼요? 그래서 나는 우리 교회는 정말 에베소서 4:3에 있는 말씀대로 사랑 안에서 사랑에 줄로 성령 안에서 하나된 것을 굳게 잡아 지키는 교회. 그래서 정말 힘차게 천국을향해서 달려가는 우리 젊은이들. 그래서 저는 어린아이들을 무시하면 저는 견디지 못 해요. 우리는 어린이들을 존중 해줘야 데요. 어른을 존경 하지 않으면 나는 또 가만히 있을수 없어요. 어른은 존경해야 돼요. 그래서 함게 나보다 남을더 낫게 여기는 마음으로 예수안에서 하나가 되어서 그리스도의 몸으로 성장하는 교회. 그리스도의 집으로 지어져 가는 교회. 거기에 우리 어린이부터 중등부 고등부 대학 청년부가 한 덩어리가 돼야 돼요. 그러면서 거기서 분명히 다니엘 같은 사람이 나올 거고 룻과 같은 멋있는 여인 에스더같은 멋있는 여인 디모데 실라 누가 마가 하나님의 귀한 젊은 종들. 또 뵈뵈같은 루디아같은 사업하는 자매들… 브리스길라 아굴라같은 멋있는 하나님에 사람들. 그런 사람들로 이렇게 지어져 가는 거예요. 우리 대학 청년부가 그래서 이땅을 변화 식이고 우리 코너스톤의 젊으니가 되면 좋겠어요 아니 돼야 돼요. 이 전쟁을 해야 돼요. I am Pastor Jong Yong Lee from Cornerstone Church and Nicole, Candy, Katherine and Ashley have come to ask me to share my testimony. I’ve attended church since I was young but as a young child, I did not believe in Jesus. Jesus dying on the cross, defeating death, and rising from the dead in 3 days was something I just couldn’t believe. For that reason, I pretended to believe in Jesus throughout elementary school, middle school, high school, college, and young adult life as if I was a Christian. Then I became a musician and my song became number 1 in Korea and persisted as number 1. There was a weekly program on MBC TV that picked music ranked popular music from 1 to 100 and my song was ranked number 1 from April to December leading me to become a very popular singer. Although I’ve never done drugs, through a drug related incident, I went to jail. I was in jail for 120 days and for the first time, I began to think about my past, my present, and my future. I began to think about what life is, about death, and what happens after death. I wondered if death meant the end of all things and if so, how are animals and humans different from each other? What is good and evil? I wondered about living a life full of worth or living a life in vain. In jail, I was able to think about many thing. I was at the very top- I had a bodyguard, a driver, and many people to help me out but I fell to the very bottom and lost everything. From being a popular singer to a prisoner in jail I ended up at the very bottom – like Saul on his way to Damascus when he encountered a very bright light that was Christ and fell off of his horse- I saw the light that was Christ and believed. As human, it is difficult to believe but it is through the grace of God. But as I lowered and decreased myself, I was able to believe God, the Creator of Heaven and Earth. Faith is a miracle. It is a blessing. Not everyone is able to believe. Does having faith in someone just come from trying? One day, you just have faith in that person. That’s what faith is like. You can’t see faith with your eyes. The truth isn’t something that is tangible through sight because everything you see with your eyes can change. But love, truth, honesty can’t be seen with your eyes. I realized that you can’t see things that are most valuable. But as I lowered myself, I was able to see Jesus Christ and accept Him as my Lord and Savior. After this season of life, my life changed. Previously, I lived for myself, but now, I want to live my life for others. I want to give. I used to only receive and thought of myself as the best, but I realized that I’m nothing without the grace of the Lord, without Christ my Savior and Lord. So I lifted the Lord up while I lowered myself. This made me want to live my life for the Lord. I wanted to give. More than anything else, I realized the biggest love was exemplified through Jesus dying on the cross and overcoming death for eternal life. So I became a Pastor. In Korea, there is a rock opera called Jesus Christ Superstar and I was the lead role. I was the lead role for Jesus Christ. I acted as Jesus 249 times through the opera. Including practices, I probably played the part 1,000 times. Through that time, I read Matthew, Mark, Luke, John and the Gospel many times. Faith is heard and hearing is through the word of God. I grew to love the Lord so much. I wanted to do the work of God so I came to America for seminary school and I have been a Pastor ever since. You don’t know how happy I am. There is so much worth in it. Cornerstone’s Mission Statement is that no matter how many people gather, no matter how big our church building is, our focus is to be a church that values a precious soul above anything. That is what I want. It is to serve each and every person in our church. If you look at the last book of John, Jesus tells John and Peter to care and feed for his sheep, so, you have to care and feed his sheep. Ephesians 4:11-16 is the scripture I received upon starting Cornerstone Church, “ to equip his people for works of service, so that the body of Christ may be built up until we all reach unity in the faith and in the knowledge of the Son of God and become mature, attaining to the whole measure of the fullness of Christ.” I do my best in order to accomplish this. I will be able to witness the power of the Lord, just as scripture says : “If the Spirit were to come to you, you would be able to receive authority and live as a witness throughout Jerusalem and Samaria and to the ends of the earth.” It doesn’t matter how many people. This is the mission statement of Cornerstone Church. 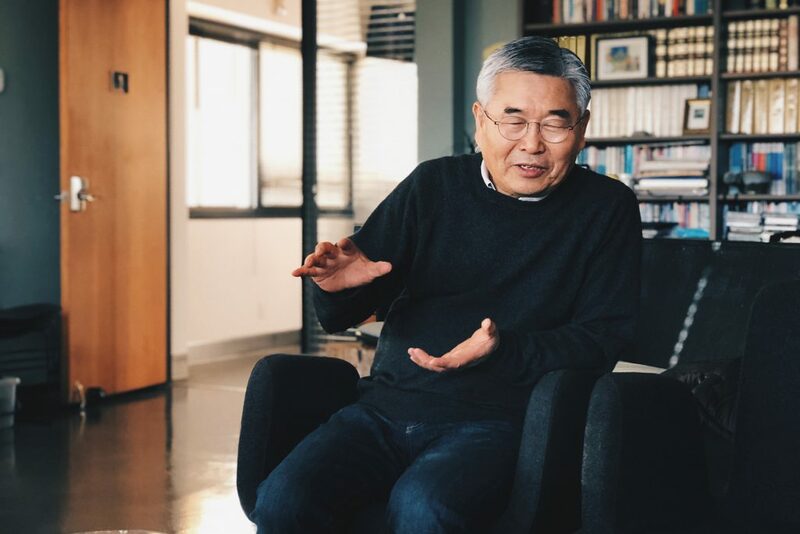 In America, many Korean American churches have a division between the 1st and 2nd generation and Korean speaking versus English Speaking but the bible doesn’t do that. A Samaritan and a Jew become one through Jesus. In Acts chapter 10, Cornelius the centurion, Peter the Jew, and a Gentile all eat together. This is something that makes no sense. Jews and Gentiles weren’t supposed to eat together. However, they eat together because of Jesus. They became one. There is sacrifice in that, but in this day and age, there is a division in Korean American churches because of a difference in language. A division between the 1st and 2nd generation. Why is that? It’s because people are selfish. It’s because people are seeking comfort. I want a church that is united from young to old without separation between the 1st and 2nd generation. We are a family of God. A church is the body of Christ. Jesus is the head and we are the body. How precious is that? Therefore, the 1st and 2nd generation, English Speaking and Korean Speaking, young to old must strive together for the kingdom of God. That includes College/Young Adult group, High School group, and Jr. High group through being one. What do Jr. High and High School students do when they come from Korea? They go to the Korean Speaking service and continue in their walk with God there which causes separation between Korean speakers and English speakers. There is no communication. However, once in school, there is no separation between Korean speakers and English speakers. Why is there this separation in church? As a church, we need to help. We need to help the students from Korea to learn English so that they may pursue their studies. But why is there this separation? This is why I want our church to be like the description in Ephesians 4:3 -” Make every effort to keep the unity of the Spirit through the bond of peace.” We must strive for the Kingdom of God, together. This is why I cannot take it when people look down at younger children. We have to respect children. However, I also cannot take it when the elderly are not respected. We have to respect our elders. We have to be a church that treats others better and a church that becomes the body of Jesus Christ. A body that builds up the house of the Lord. A church that strives to be one body in the Lord. In that process, from the youngest child to the oldest adult, we must be one body. In that, may people become like Daniel, Esther, Timothy, Silas, Luke, and Mark. Women like Lydia and Phoebe… and become amazing people like Priscilla and Aquilas. We have to become people like that in the bible. It’ll be great for our College/Young adult to become people that change the world. No, you must become people like that. We have to fight the good fight.